Red Decorative Ball On The Xmas Tree On Glitter Bokeh Background. Merry Christmas Card. 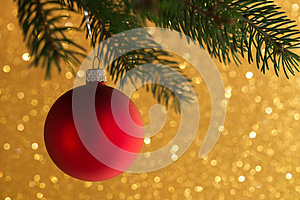 Photo title: Red decorative ball on the xmas tree on glitter bokeh background. Merry christmas card. Red decorative ball on the xmas tree on glitter bokeh background. Merry christmas card. Winter holiday theme.